This class focuses on vibrational and meditative aspects of yoga. 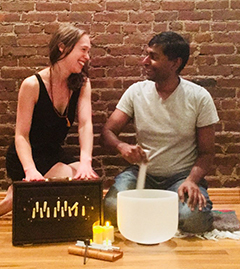 Sound meditation paired with breath awareness is designed to connect all branches of yoga while promoting healthy emotions and rejuvenating body, mind and spirit. Includes light stretching and guided meditation, using bolsters and cushions to create a safe posture. The experience is complemented by crystal bowl and chime sounds to help one travel within for healing. It finishes with deep breath work for further purification and rejuvenation.